Belarus and Ukraine want to achieve an $8bn trade turnover and have “no political problems at all.” Foreign Minister Makiej: Belarus does not want to depend on anyone else—whether it be Washington, Brussels, or Moscow. 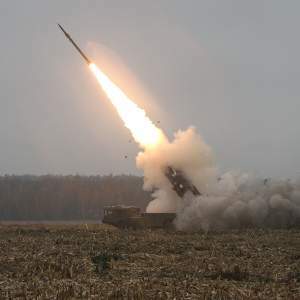 Belarus tests the upgraded version of the Palanez multiple rocket launcher. The government admits it negotiates with the IMF to improve its reputation, not to get loans. The external public debt of Belarus reaches 30 per cent of GDP. The Hrodna visa-free zone earns $10m during its first year of operation, yet many problems remain. Belarus and Ukraine want to achieve an $8bn trade turnover. The presidents of Belarus and Ukraine held a meeting in the United Arab Emirates during their working visits to the country, writes Belarus Segodnia. As Belarusian President Alexander Lukashenka stated, trade turnover between the countries already amounts to over $3bn, in spite of all kinds of problems and obstacles. There are hopes that further cooperation among the two countries’ regions can more than double this figure. In July of this year, during an official visit of the president of Belarus to Ukraine, leaders set a goal to restore the highest level of mutual trade from past years and bring it up to $8bn. Strengthening inter-regional ties was defined as the main tool to achieve the goal. “As for political interaction, we have no problems at all. We absolutely follow the course on which we agreed earlier,” Lukashenka said. Belarusian Foreign Minister Uladzimir Makiej gave an interview to Financial Times. According to the quotes from the interview published by Zviazda, Belarus does not want to depend on anyone else—whether it be Washington, Brussels, or Moscow. The country just wants to pursue a truly independent policy. Belarus seeks to diversify trade and economic relations, and the EU plays an important role in these aspirations. Today, not only states, but also unions of states in different regions of the world need to establish cooperation, said the foreign minister. In Europe, it is the European Union on one side and the Eurasian Economic Union on the other. The minister also told the interviewer that the government plans to increase the length of the visa-free stay period in Belarus to up to 30 days, yet this decision will be implemented gradually. Belarus tests the upgraded Palanez. The Belarusian military have successfully conducted a test launch of the upgraded version of the Palanez multiple rocket launcher in the Homiel region. The missiles struck assigned targets and confirmed declared tactical and technical characteristics in terms of range and accuracy. With the latest modifications, the missile system allows attacking of targets within a radius of up to 300 km, writes Belarus Segodnia. The long-range Palanez multiple-launch rocket system was created by the Belarusian defence industry and corresponds to the world’s best analogous missile systems. In the future, the upgraded Palanez missile system will equip the rocket and artillery units of the Belarusian Armed Forces, which will significantly enhance their capabilities. What’s on Belarus’s black list? The Information Ministry of Belarus updated the list of extremist materials prohibited from dissemination according to the Law on Combatting Extremism, reports Zviazda. The new list contains a few types of written and online materials. Radical Orthodox and Russian nationalist materials, radical Muslim, Nazi, and anarchist themes occupy roughly a 25 per cent of each type. Opposition-related materials occupy only a few places on the list and most of them date to before 2010. The external public debt of Belarus reaches $16,3bn, or 30 per cent of GDP. In January–September 2017, the country borrowed $3.4bn, of which $1,4bn came from issuing Eurobonds, $1.1bn from the Russian government and banks, and $600m from the Eurasian Stabilisation and Development Fund. Belarus’s recent creditors also include Chinese banks, the IBRD, the EBRD, and the Nordic Investment Bank. For a few years already, Belarus has had to allocate more than $3bn annually to repay existing debts. In 2018, the country will repay a record-breaking $3.7bn in debt. A large part of this debt arose when the government borrowed for the modernisation of state companies hoping that later they would become profitable. But that did not happen. The state must now repay their loans. Moreover, it continues to help inefficient enterprises at the expense of the state budget. Another major problem is the need for foreign currency to service the debt. Additional new loans remain the main source for debt repayments. Belarus negotiates with the IMF for reputation, not loans. First Deputy Prime Minister of Belarus Vasiĺ Maciušeŭski during the annual October Economic Forum in Minsk stressed that cooperation with the IMF is necessary for Belarus not so much to obtain loans, as to improve the reputation of the country in the eyes of potential investors, reports Belarus Segodnia. “Market participants traditionally view the IMF as a global auditor. We just need a dialogue with the IMF, so that they confirm that we are moving in the right direction, that there are no threats for investors,” Maciušeŭski explained. The vice-premier also said that in the course of the last discussion of a program with the IMF, the sides appeared to have different visions of the speed of implementation of certain policies. “And we explained why: reform for the sake of reform is probably wrong. Reforms are conducted in order to increase the effectiveness of something and get some result, which the society will understand and support. When society does not support reforms, it is better not to conduct them. There is a good thesis: the discrediting of a programs is worse than not implementing it,” he stated. Hrodna visa-free zone summarises its first year of operation. In 2017, 43,000 tourists from 65 countries visited the Hrodna visa-free zone, reports Respublika. The city of Hrodna earned $10m from this policy. The new visa regime has led to the growth of new tourist infrastructure: the number of travel agencies engaged in inbound tourism has increased nine-fold; nine new cafés have opened and 30 outlets have began to provide duty-free services; and a few new hotels and hostels have appeared. An average tourist spends 60–70 euros each trip and mainly buys sweets, alcohol, textiles and knitwear, shoes, medicines, and handmade souvenirs. However, the infrastructure of the region remains insufficient, as parking spaces, hotels, cafes and restaurants still cannot satisfy demand.